Ahhh… vacation time! A chance to get away from the ordinary everyday routine. 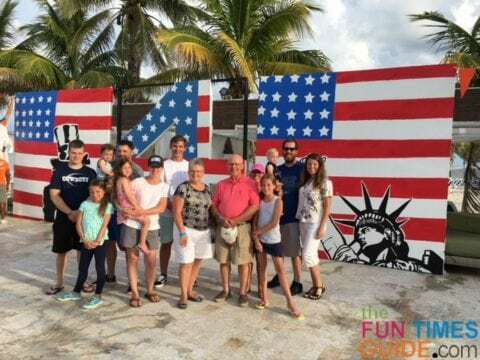 We traveled to the Bahamas with my husband’s side of the family to celebrate a 50th wedding anniversary. There were 15 of us in our entire group — which meant a break for me from my dear son (16 months old at the time) with so many additional family members to help watch and entertain him. 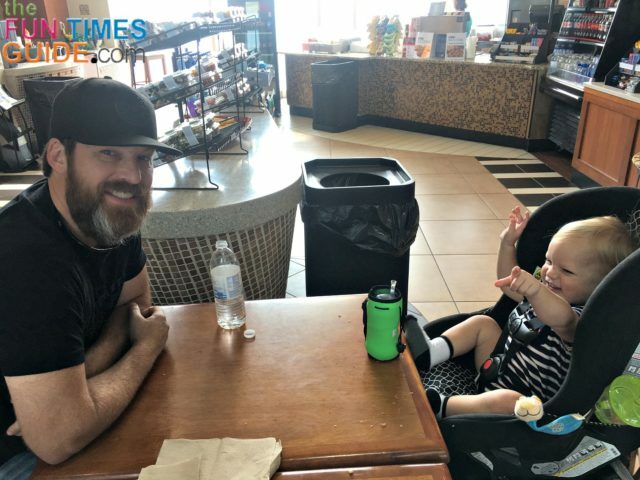 It was a direct flight for all of us departing from Nashville Tennessee, and my son was asleep as soon as we got in the air. It was only a 2.5 hour flight, so it went by quick — until we found ourselves stepping off the plane and breathing in the warm Bahama breeze. This would be my son’s second international flight, but his first time to the beach. I researched all kinds of articles from several other Mamas who shared their own personal recommendations of what to bring and what to pack for baby’s first time at the beach. Some of their baby beach gear lists were quite lengthy. I really dislike over-packing (something I have a tendency to do) — so I decided to try to keep my item list as simple as possible this time. My DIY car seat dolly has been a lifesaver on both of our big trips. It was especially handy to have at the beach resort — as a way to cart my son around the resort, because everything was so spread out. 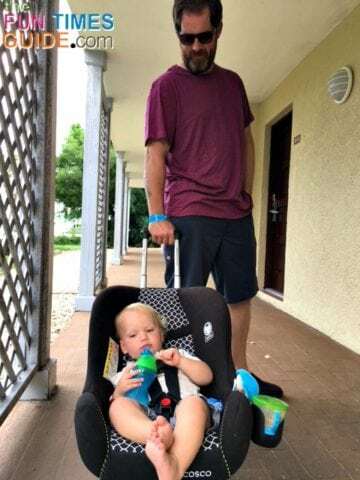 It saved my husband’s back from having to carry our son for what seemed like miles each day while making our rounds to the beach, the pools, and the restaurants. The car seat itself worked well in the restaurants too — because they had limited high chairs available at the time, since multiple families were eating at the same time. We were able to place the car seat on a bench, in a booth, or on a chair to be guaranteed an instant booster seat! Pampers Splashers diapers are designed to not swell — because they’re not absorbent like regular diapers. But they will keep poop contained inside the diaper, if baby happens to poop while swimming in the water. They pull up like underwear, and they easily tear away once you’re finished using them. A baby swimsuit (or shorts and a swim shirt) help protect your baby’s skin from the sun. We really like the Rashguard swimwear with UV protection built into the fabric. With the partial arm and leg covering, it’s a great way to keep young skin covered and protected from damaging sun rays. I packed multiple swim sets for my son — because nothing ever dries quickly in the Bahamas, and trying to put a wet swimsuit on a baby is never easy. I made sure to pack enough baby diapers and wipes for the entire trip — so I wouldn’t have to worry about overpaying at the gift shop or having to venture off the resort to go into the market to buy diapers or baby wipes. My 16-month-old did not like to wear his sun hat, but eventually he would forget about it after a few minutes of distraction. 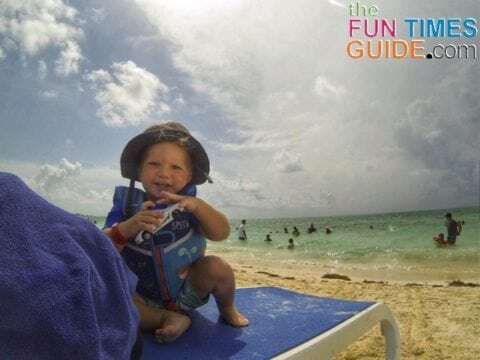 We definitely wanted to keep the sun off his head and face — especially with limited shaded areas while playing in the pool, the ocean, or on the beach. We really like the Titop infant swim vest. It fits nice and snug with a crotch strap — to keep it from floating up past baby’s head. We kept our son in his life vest anytime he was near the water, ocean, or pool. We would allow him freedom to crawl — while supervised on the beach or poolside, so he could explore all the wonderful new sensory experiences. I’ve always used coconut oil as a baby diaper cream. It has worked well on my baby in clearing up any potential diaper rash at the first sign of redness. Coconut oil also works great as an after-sun moisturizer, too. You just need to be careful to seal it inside a bag while traveling — because coconut oil turns to liquid once it reaches 74 degrees. My husband was always diligent in spraying our son with baby sunscreen regularly throughout the day during our play time in the sun. We definitely did not want to have a sunburned baby to deal with. I didn’t want to overpack like I always do — so I just packed a few small cars for my son. He was entertained just fine playing with whichever toy/car we brought to the water each day. We didn’t bring any of the traditional baby beach toys. We always travel with snacks — because they can be a great distraction for baby. Even though we were at an all-inclusive resort, I still packed snacks for this trip — since there are always transit days and late morning starts to consider. On this trip, I sometimes filled his snack cup with special treats from the restaurant for added variety during the day. I like the Munchkin Snack Catcher snack cups because they keep the food from spilling out and can easily be managed by baby. I’m a big fan of no-spill drink cups. I especially like the Nuby no-spill cup with flex straw. On this trip, we always kept my son’s drink cup filled with water & ice — so he could stay hydrated all throughout our fun days in the sun. At the beach, there will be sand… sand… and more sand! It’s hard to escape it. And your baby will always manage to find the water and pick up even more sand. Plus, in the Bahamas clothes take forever to dry — so it’s important to not run out of clean clothes for baby. Packing a baby thermometer is a necessity for “just in case”. I always want to be able to check my son’s temperature in the event of sudden sickness or fever — especially in a foreign country. I packed an inflatable baby pool float with canopy — but my son didn’t want anything to do with it! So this is something that is definitely dependent on your baby’s preference. It seemed like a great idea to have a built-in canopy on an inflatable float. We’ve tried it since then, and he’s still not really a fan. Unfortunately, I wanted him to enjoy it more than he wanted anything to do with it. 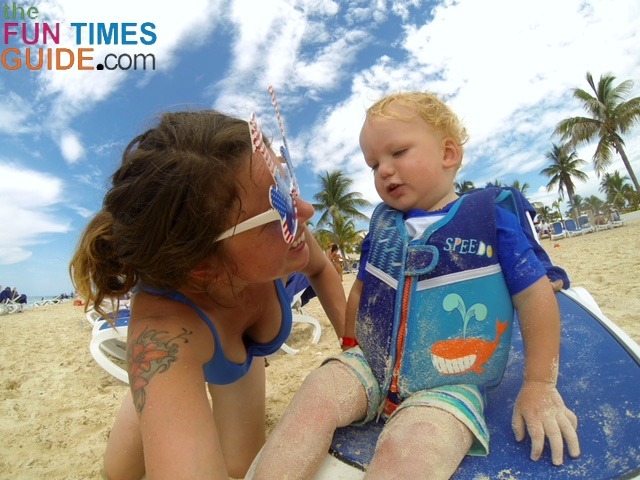 Any waterproof camera will work, but I was so thankful to have my waterproof GoPro with me to capture precious first moments at the beach without having to worry about getting my iPhone wet. The GoPro is the perfect camera — because it’s small, compact, and completely submersible under water. We had a really hard time getting any of our wet items — including towels — to dry due to the limited places to hang them in the hotel room and balcony. It seems to be a recurring theme anywhere we stay. I always say to myself, “I’ll definitely pack one next time!” …and then I always forget. We were really fortunate that we had a great first experience with baby at the beach! It was important for me to let him crawl, explore the local foliage, and be covered in sand. My son really seemed to enjoy his pool, ocean, and beach time at the resort and playing with all of his extended family. He handled the traveling and the sensory overload like a professional vacationer.